On January 11, I posted a photo essay of a winter walk up the Namsan, a mountain south of Kyongju. 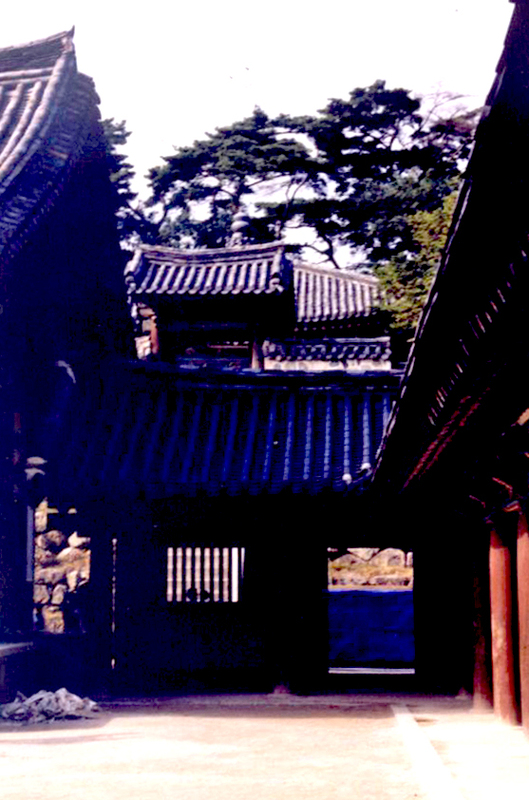 This post will be a tour of Bulguksa (Buddhist Land Temple) southeast of Kyongju, using photos I took during my many visits. 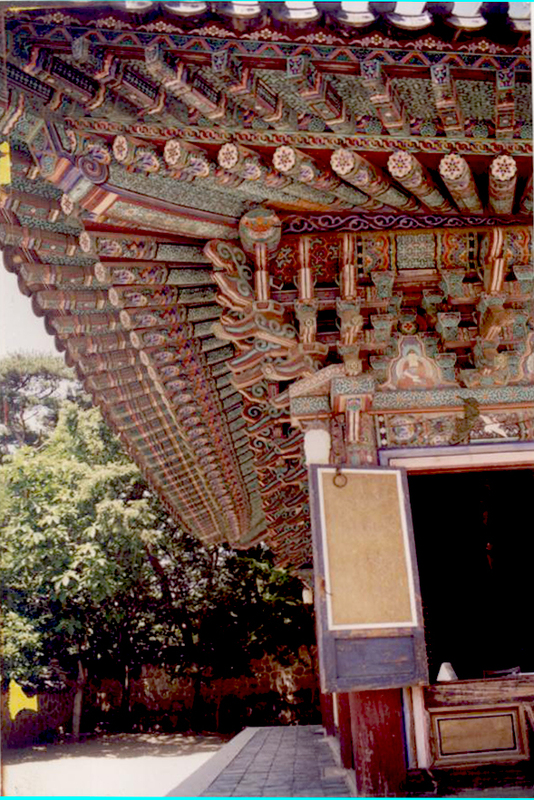 We’ll start at the main gate and move slowly toward the back of the temple complex. 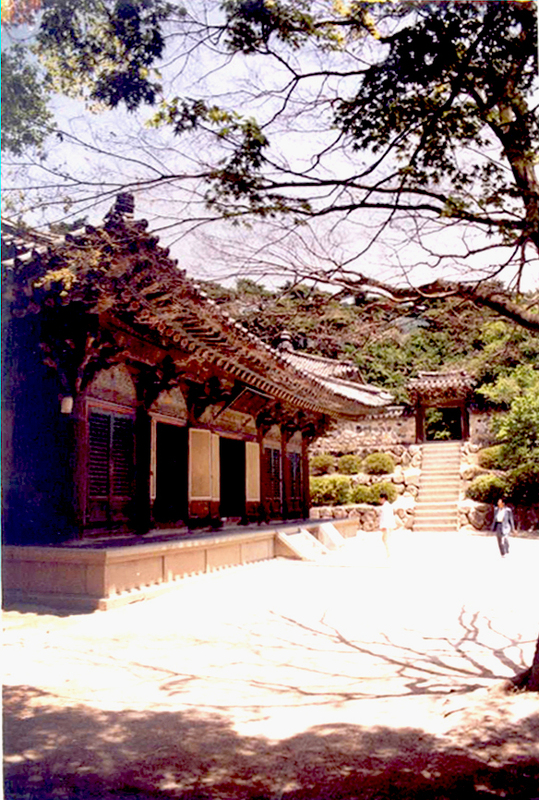 Bulguksa is the country’s number-one historic and cultural site and a masterpiece of Shilla (Silla) Dynasty art and architecture. 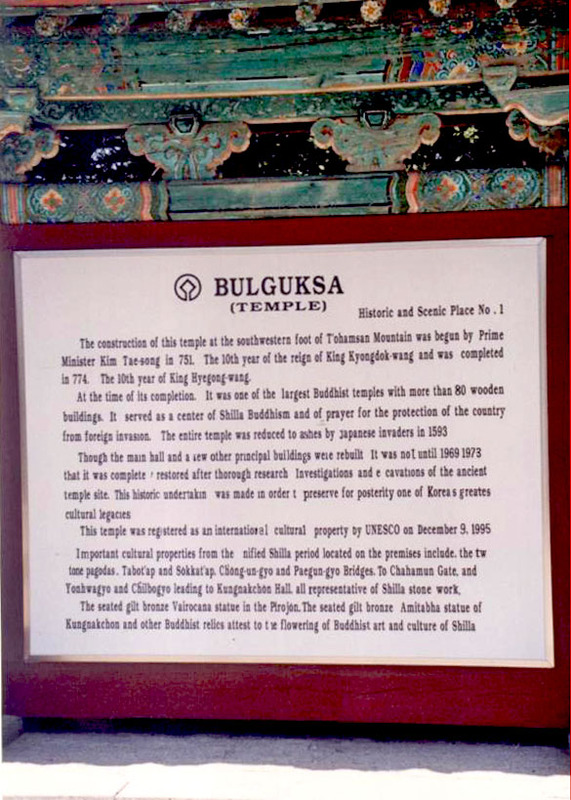 The current temple was built from 751-774 on the site of a previous temple. 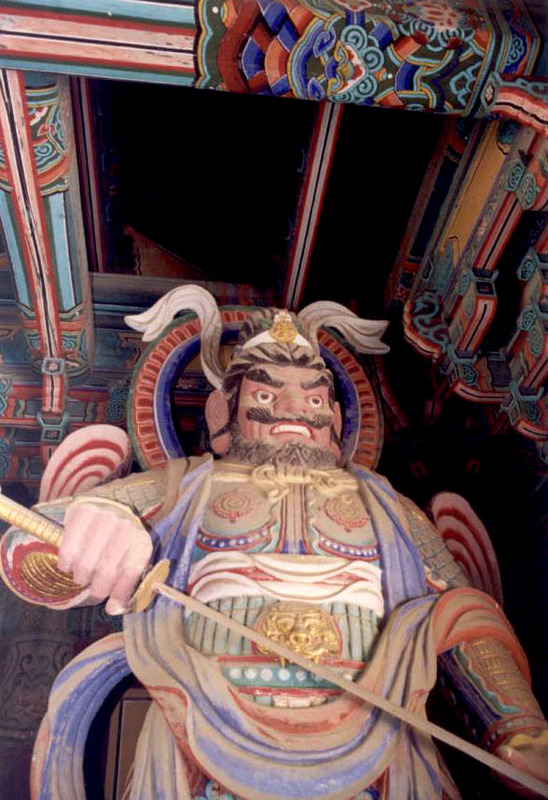 This was under the direction of King Gyeongdeok’s Prime Minister Kim Daesong. 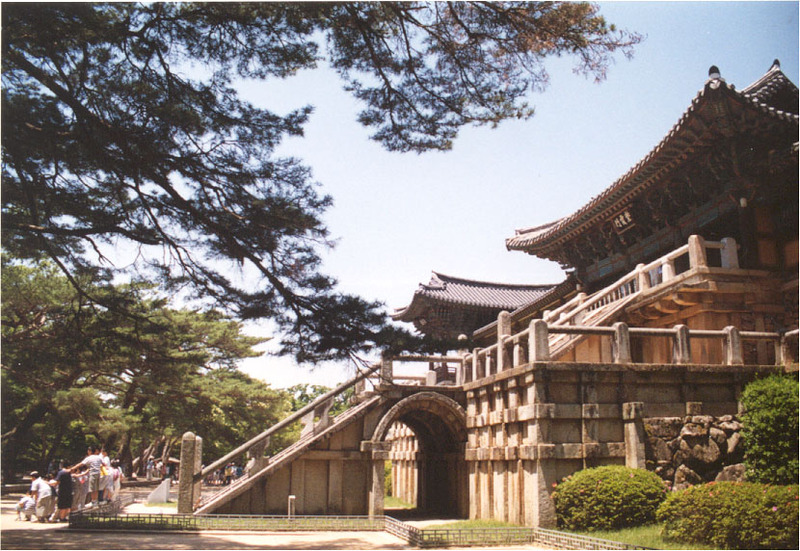 The wooden parts of the buildings were destroyed during the Japanese invasions in the late sixteenth century and restored under President Park Chunghee, but the stonework is the original Shilla construction. 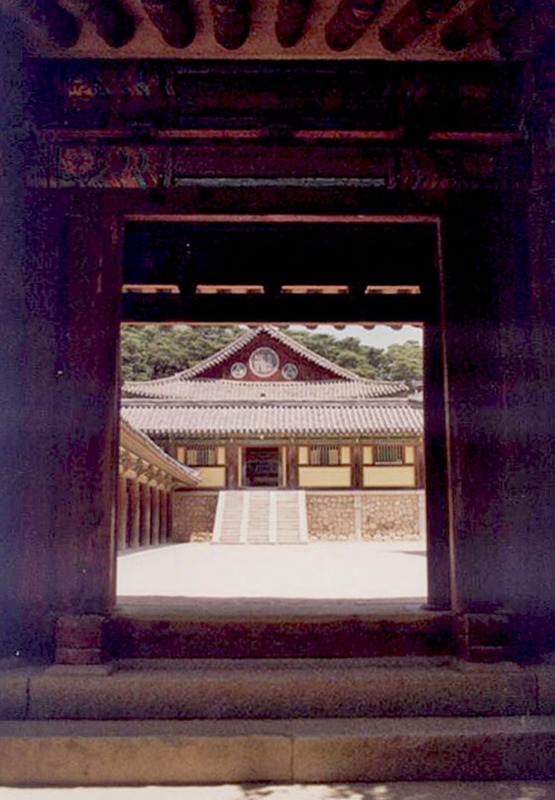 The temple belongs to the Chogye (Jogye) Order. A link to the Wikipedia entry is on your right. 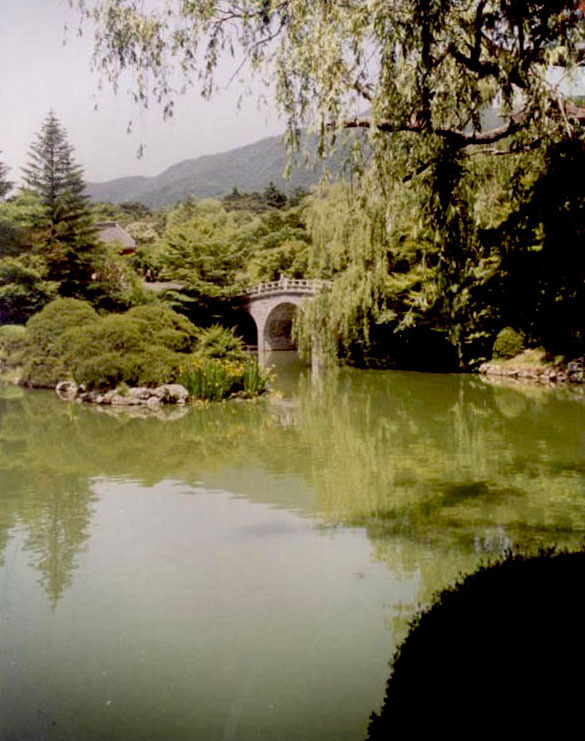 We pass through the first gate, pass female gardeners in their white sunbonnets, walk over the pond bridge and then come to the main gate, a building which houses the huge statues of the Guardians of the Four Directions. 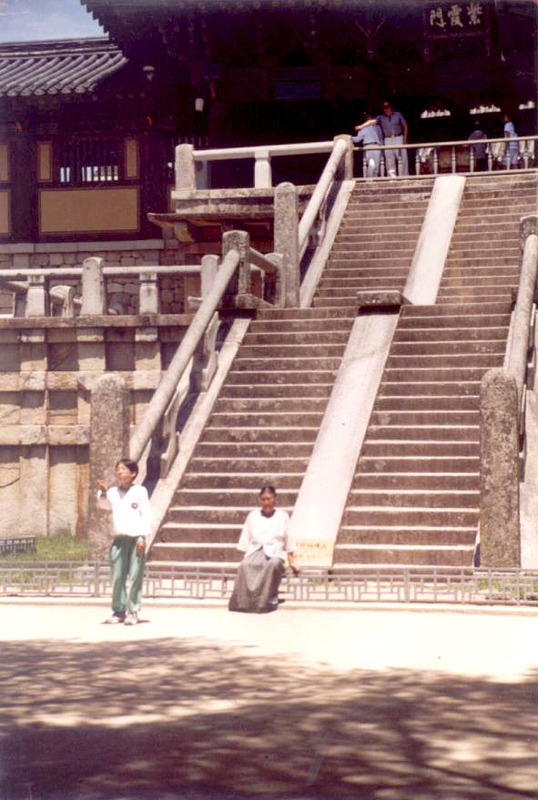 Inside the main complex, we see first the Jahamun (Mauve Mist Gate) and the two flights of stairs leading up to it, called Blue Cloud Bridge and White Cloud Bridge, which together symbolize the thirty-three steps to enlightenment. We take the road up the hill and around Jahamun in order to see the two pagodas. This is Dabotap, dedicated to the many treasures mentioned in the Lotus Sutra. 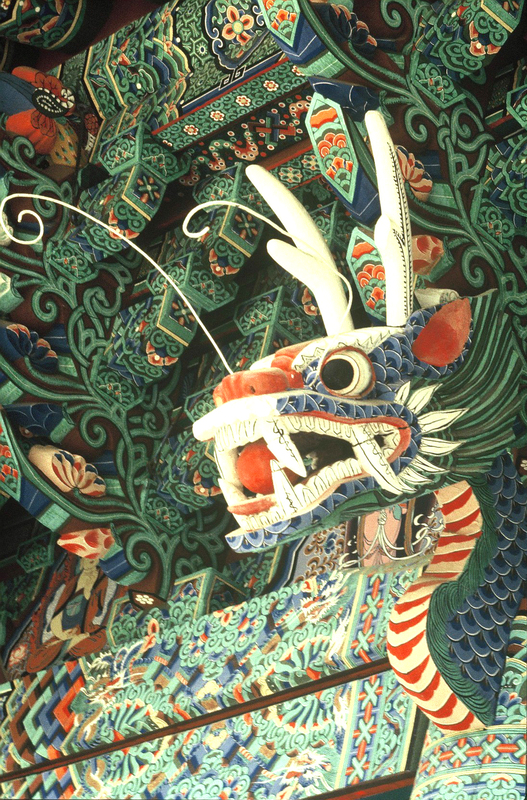 Here are some shots of temple roof eaves and a corner dragon. Moving further back, we find two more sets of stairs and some more temple halls with altars (no photos permitted). 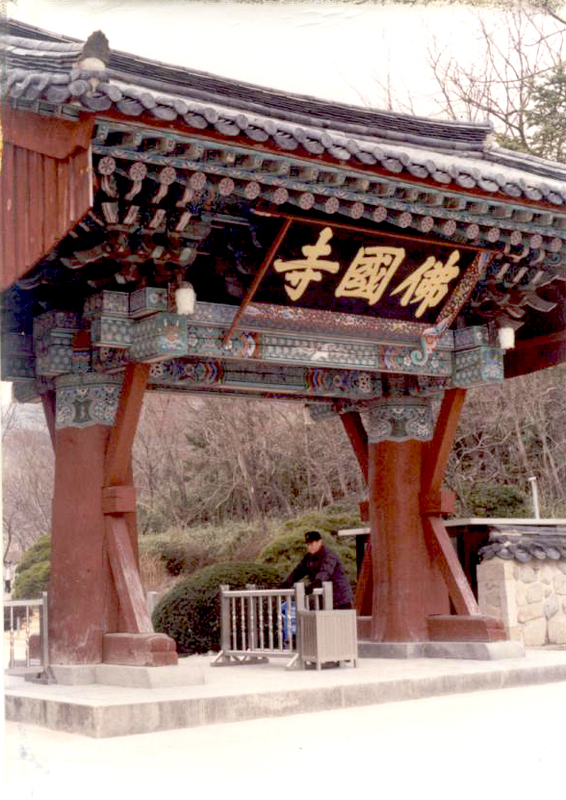 These are Birojen, the relics monument near it it and Gwaneumjeon and the gate in front of it, then through it to rooftops . 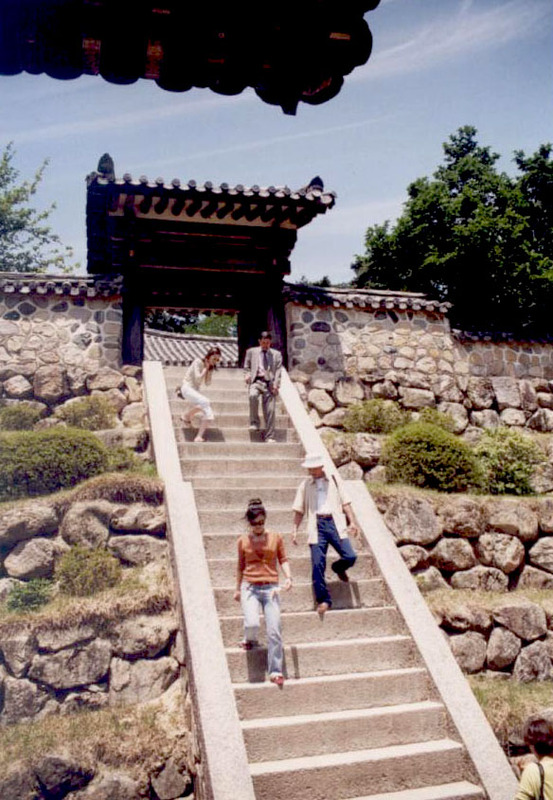 Then steps descending from the back. 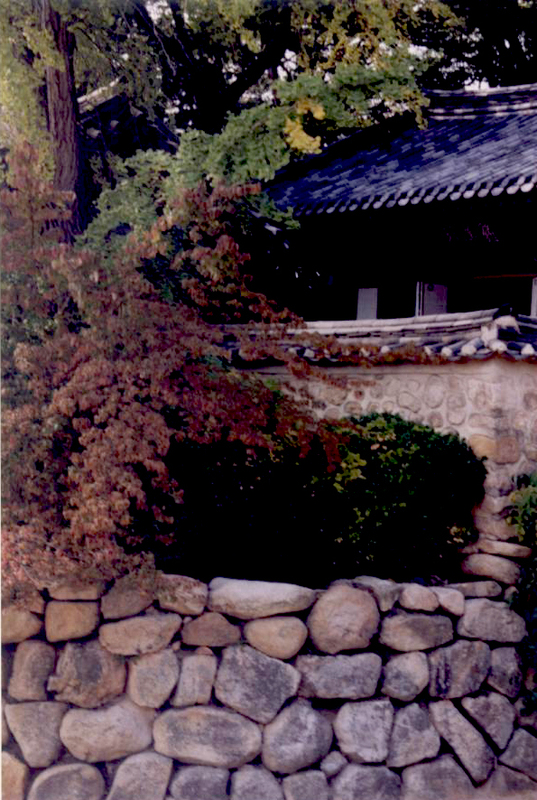 Not all of the stonework is the mortalless Shilla Dynasty work that Bulguksa is famous for. 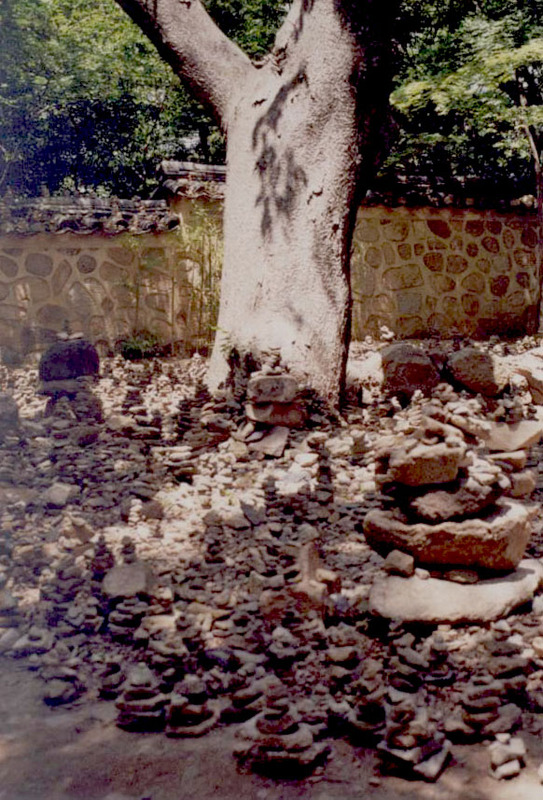 At the edge of the complex, we find a well and an area filled with tiny rock piles, a shamanist bid for good fortune. As we leave, we look out over the lovely countryside.